It is Sunday afternoon, the temperature is hanging around 37 degrees and it is raining off and on. Not exactly the weather I want to be making boomerangs in. Wish I could do something. Wait a minute, didn’t Chris send me some black plastic deli tray bottoms? Where did they go? Hmmm, check the storage shed, they must be there. Found them, let’s get back in the house where it is warm. Ok, back in the house and at the computer on Pierre Kutek’s site looking at plans. Here’s an interesting one, a triblade called Triple 6. On the same plan is the Forty Four, a quad that looks promising. I also find the Floatsy, another quad design I like the look of. I print and head to the kitchen where the stack of plastic waits. For the first shapes I tape the plan to the plastic and cut them out with a kitchen scissors. This stuff cuts sort of easy, except for the edges where the tray is not flat but has ridges. Fortunately this area is not on the boomerang itself. 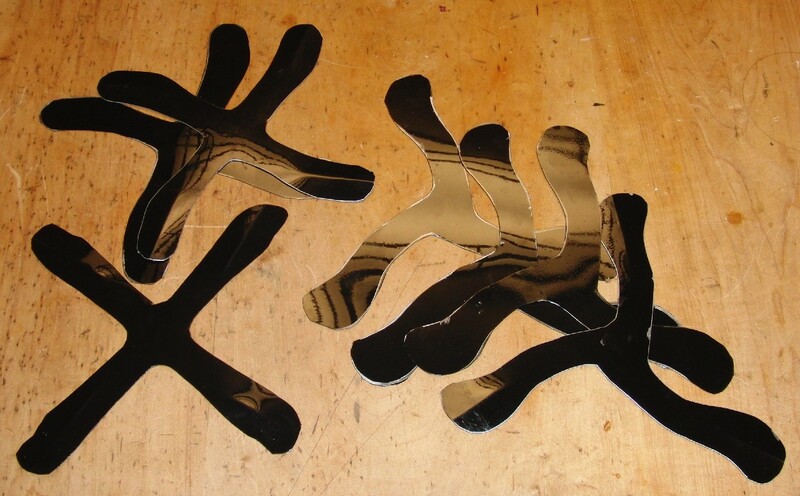 I cut out one of each shape and quickly bend in an airfoil. The I slip outside into the cold for a test throw. The Triple 6 is a winner! Nice range for a backyarder and a fairly low flight, I like this one alot. Next is the Floatsy and I have figured out what it is named so. It makes a very short flight, rather hight and floats in. I tweak the airfoils and tuning to increase the range. Its not one of the longest backyarders I have ever seen but has loads of hover. The Forty Four turnes out to be an excellent quad. Back in the house I use the three to trace out additional copies and cut them out. I am not bending in airfoils yet but will wait and maybe try more or less bend. I might even try some with just positive diheadral. These will be fun to play with. 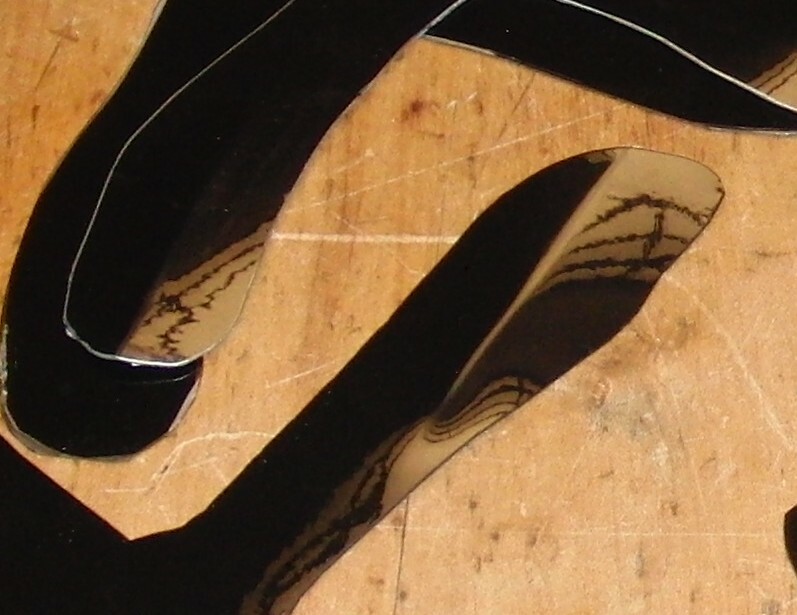 Here’s a close up of the bent airfoils. Well, I seem to have succeded in having some fun with boomerang building on a cold, wet Sunday afternoon in January. Thank you Chris for the material. It was fun. 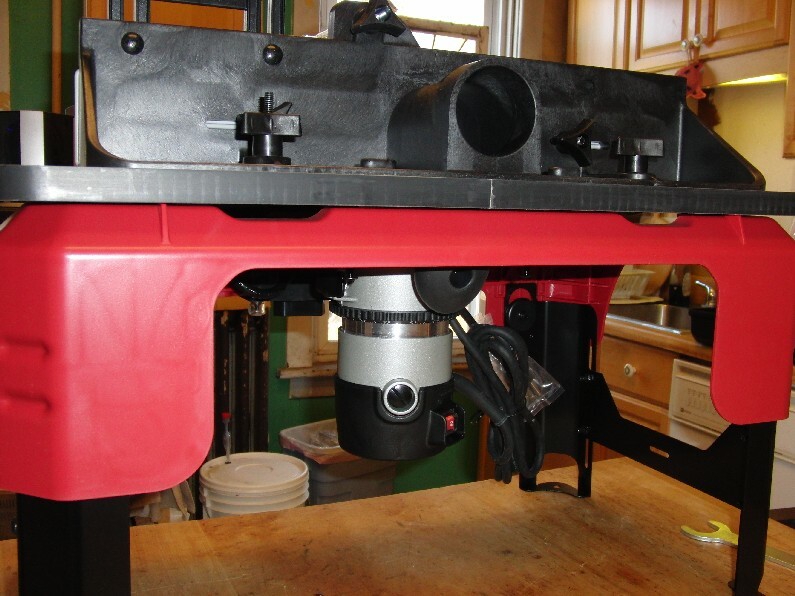 It got all the way up to 45 degrees Saturday and I set up the new router table in the yard. I had some boomerang blanks to make and this was the test of the new system. 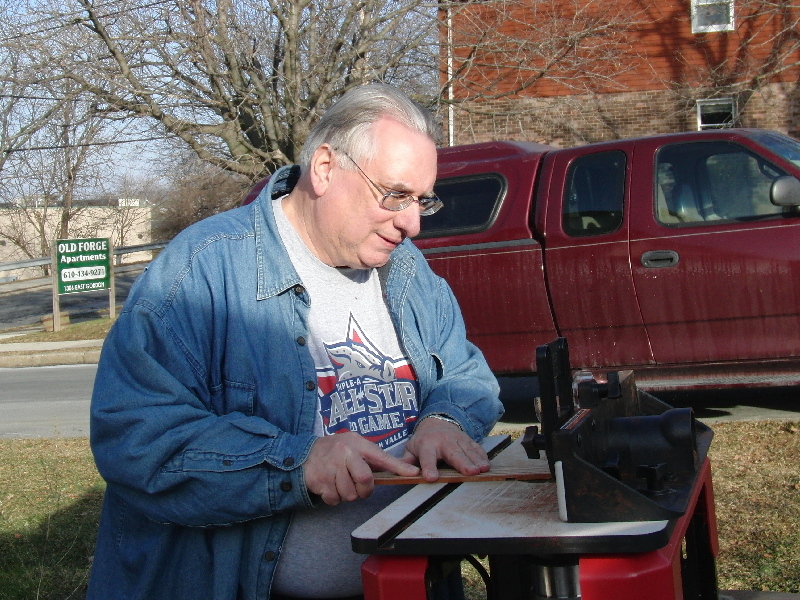 As you can tell, I am merrily making shavings with the blanks. I got a total of 8 sets lapped. I still have a little trouble getting the bit height correct but that will get better as I work with the new router. It certainly has the horsepower to handle the job and the collet hold the bits firmly. Sunday was much colder (35F) and rainy so I spent a limited time in the garage. After gluing up the blanks on Saturday night I was ready to cut them out. 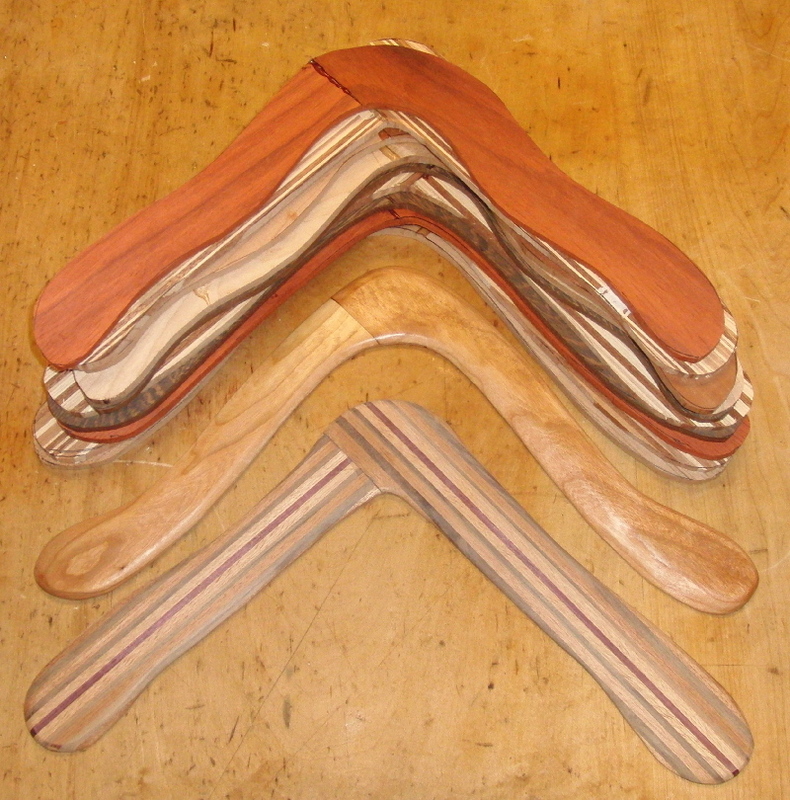 I chose several shapes including a new one in which I stretched a Binghi Eagle to fit the wood. I like the looks of this one and cut three different woods in this shape. With the blanks I did a month or so ago, and this batch I have 12 to work on. Here’s a look at them. The two in front I have already done the shaping of the airfoils. Looks like Santa Barb came through and solved some of my router problems. 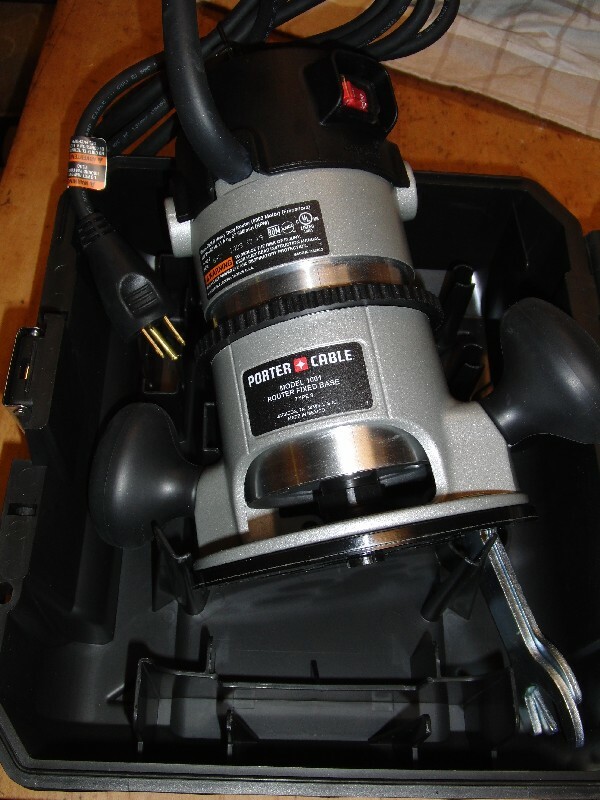 On Christmas I received this new Porter Cable router. Nice, eh? Its a well built router and the collet looks very good, which should eliminate that slippage problem. I decided to mount it in the old router table but ran into a problem. The Craftsman table I own has pre-machined holes for mounting the router and they only fit Craftsman routers. Modifying the table looked to be a lot of trouble. I could possibly make my own table but with the limited time I have to do any work, I would rather make boomerangs than router tables. 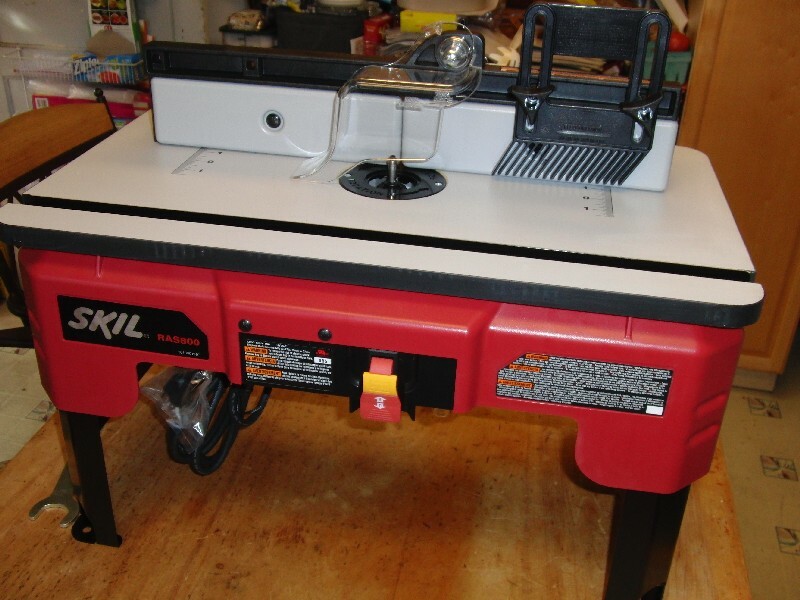 Barb and I stopped at Lowes after the gym one morning and found this dandy router table by Skil. The table comes assembled and has legs that fold up so it takes less space. I like the design and the router mounts in a matter of a minute or so. Here’s a lower view from the back, so you can see the router mounted and the fence with dust collection port. Only bad thing so far is that it has been so cold since I bought the table, that I haven’t been able to go in the garage and try it out.